“The Intl. WeLoveU Foundation have sung songs of love and hope, and borne much good fruit. We will sing the songs for far more people,” said Zahng Gil-jah the Chairwoman of the Intl. WeLoveU Foundation. 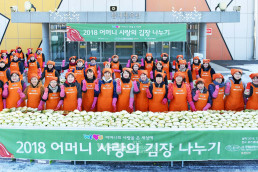 On December 15, the Foundation sang songs of love and hope again for our neighbors in the globe by holding the “11th New Life Concert.” The concert was supported by the Ministry of Health and Welfare, Seoul Metropolitan City, Korea Youth Work Agency, Sejong General Hospital and Sisa Media of JoongAng Daily. This day, the Foundation delivered a total of 200 million Won to Korean victims in Yeongpyeong-do, Indonesian victims of volcanic eruption of Mount Merapi, Pakistani flood victims, African children who were suffering from disease, Korean patients suffering from rare and intractable diseases, and multi-cultural families in Korea. At the Student Gymnasium, Songpa-gu, Seoul, a feast of love was held, transcending national boundaries. Although the piercing wind was blowing outside, the concert hall was warm as warmhearted people filled the place. 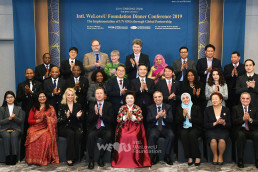 They were 8,000 members of the WeLoveU Foundation, including Chairwoman Zahng Gil-jah, Sponsor Chairman Lee Sun-jae, C. Mintah Agyemang the Minister Counselor and Charge d’affaires of the Ghana Embassy in Korea, Mudassir Iqbal the Consul of the Pakistan Embassy in Korea, Shim Oh-taek the Head of Project Aid of Presidential Council on National Branding, Ryu Tae-yeong the the President of Tomorrow Foundation for Korean Youth & Rural Development, and Park Yeoung-gwan the President of the Sejong General Hospital in Bucheon. The three-hour concert started from the donation ceremony. 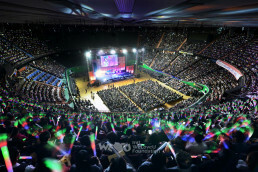 After that, the Goodwill Ambassador Kim Sung-hwan presided at the concert. All the members of the cast threw themselves into songs of love and hope. They deeply moved all the audience. Vocalists Lee Seung-hun, Kim Min-gyo, Baek Mi-hyeon, Kim Jae-hun, Yun Tae-gyu and the group Sunflower, and the New Life Children’s Choir belonging to the WeLoveU Foundation as well, sang for our unfortunate neighbors. The vocalist Yeh Song, who sang the song “Windflower,” the TV Drama “Queen Seon Duk”’s OST, first appeared on the stage. The families of diplomats in Korea also sang a song, titled, “We Are the World,” and it kindled the atmosphere. 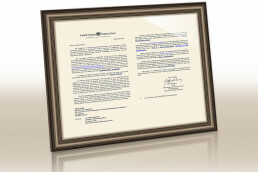 Just like the logo song of the WeLoveU Foundation, in the coming year 2011 and the following year, too, the Foundation will continue to work for our global neighbors just like a mother takes care of her children.